Thursday, December 13th. It was a day off from work. I had no obligations, there were no craft fairs or art shows to get ready for, and my last art deadline was Wednesday. And the weather was promising: sun, highs in the low-mid 40's, no rain in the forecast. Yep, a good day for a ride. And I just knew where to ride and what to ride on. For the what to ride on, it was pretty obvious: the Raleigh Crested Butte. While I have been riding this bike a lot over the last month or so, I have had few opportunities to take it on a really good ride. As for where to, the bike led to the decision: Forest Park. For those of you who don't know, Forest Park is Portland's largest park, sometimes billed as the largest city park in the US. While this claim has been disputed, it's still a big park, 8 miles long and 5,000 acres in area. And like its name states, it's a "forest". 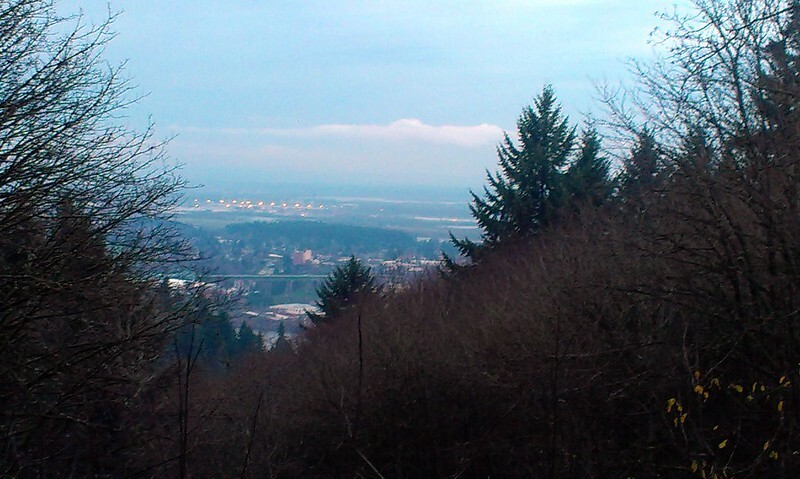 And while little of it is old-growth, it still provides the best "in the woods" opportunities for us urban folk--without leaving Portland's city limits. Its lack of singletrack mountain biking is an area of consternation to some, but there is a good amount of what would be called "green lanes" in the UK--rough dirt roads and tracks. A perfect testing ground for the Crested Butte's "rough stuff" capabilities. 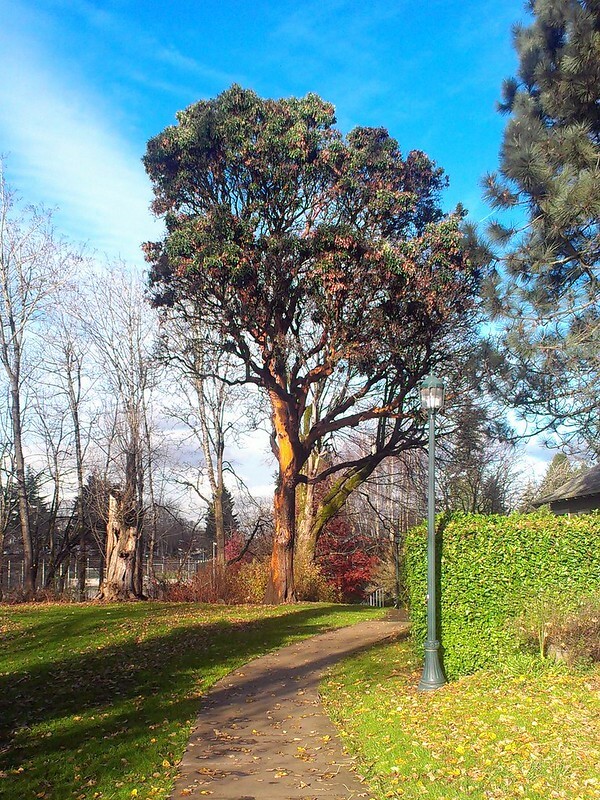 The madrona of Madrona Park. The dead madrona of Rivendell Ridge. 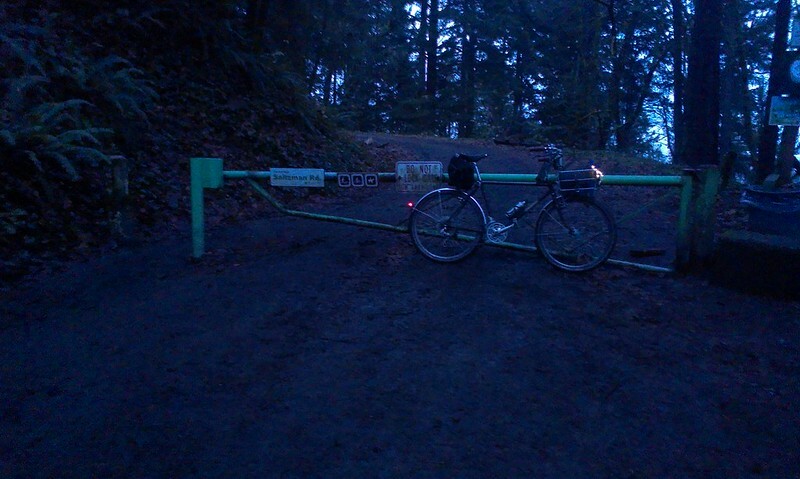 The easy logical thing would be to access the park via NW Portland and ride out on Leif Erickson Drive. 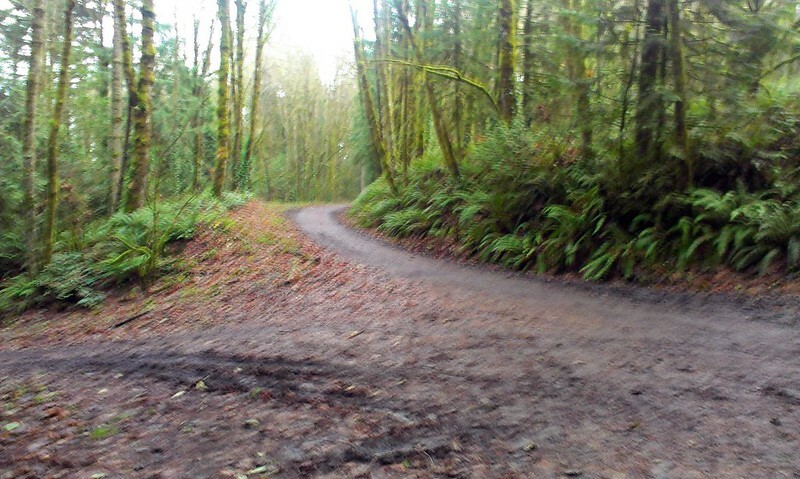 Leif Erickson is a one-lane dirt road that winds for about 10 miles through Forest Park. 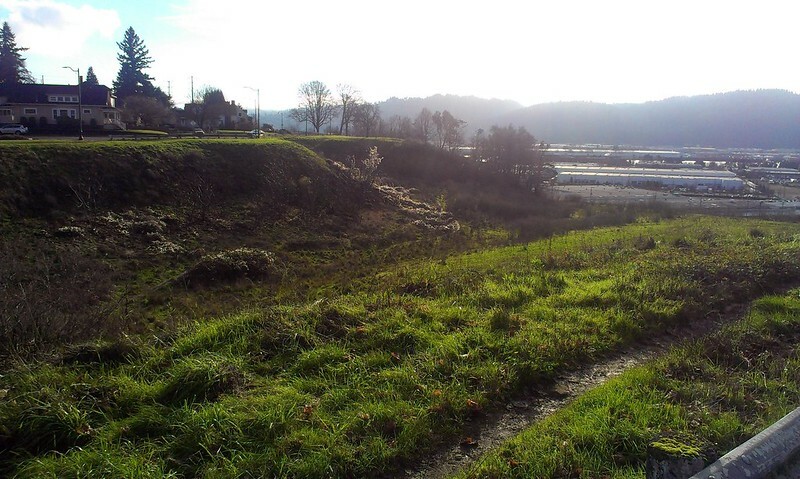 It's a well-graded road too (in steepness, not always in road condition) as Leif Erickson was designed primarily as an auto through-route in the days before Forest Park was a "park" and when they were trying to develop it for residential use. (That was before they found out the hillside was continuously moving downwards, making building houses less than ideal.) But me? Be logical and practical? No. 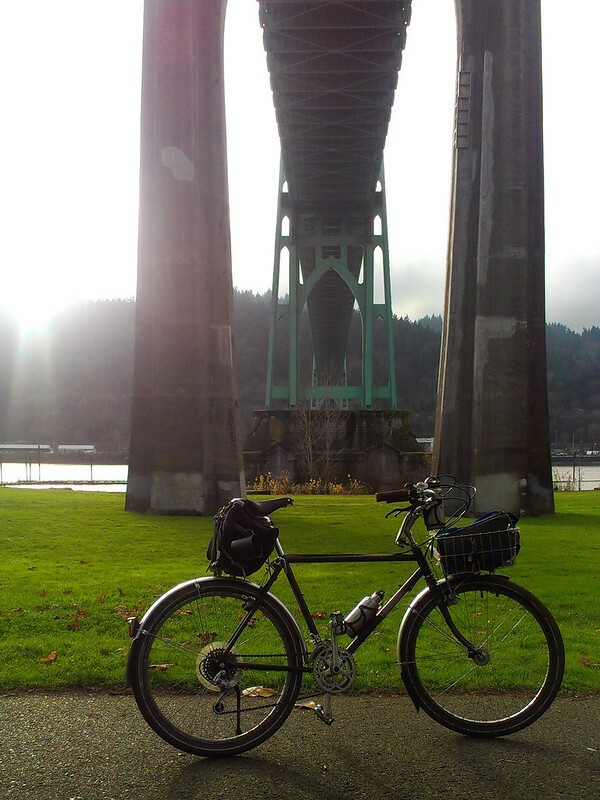 I decided that I would access Leif Erickson from near its north end by the St Johns Bridge. This would allow me to ride through North Portland--the peninsula--to get there. It's been awhile since I had the excuse to go out to St Johns, so now was the time. With the limited hours of daylight around the Winter Solstice, it would have behooved me to get up early to take advantage of what little sun we'd be getting. But noooo. I didn't roll out of bed until almost 10am and didn't really hit the high road until noon. 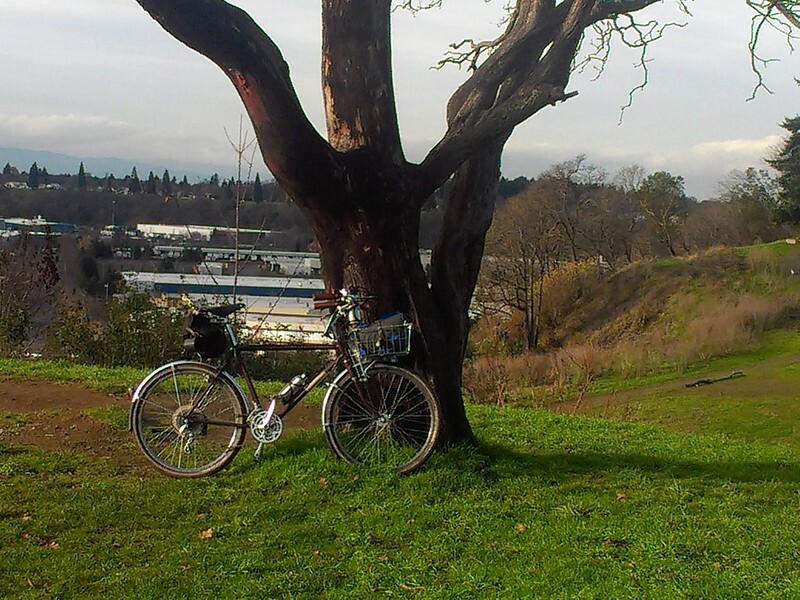 And while North Portland wasn't the primary goal of the ride, I couldn't help myself from being distracted by this area. 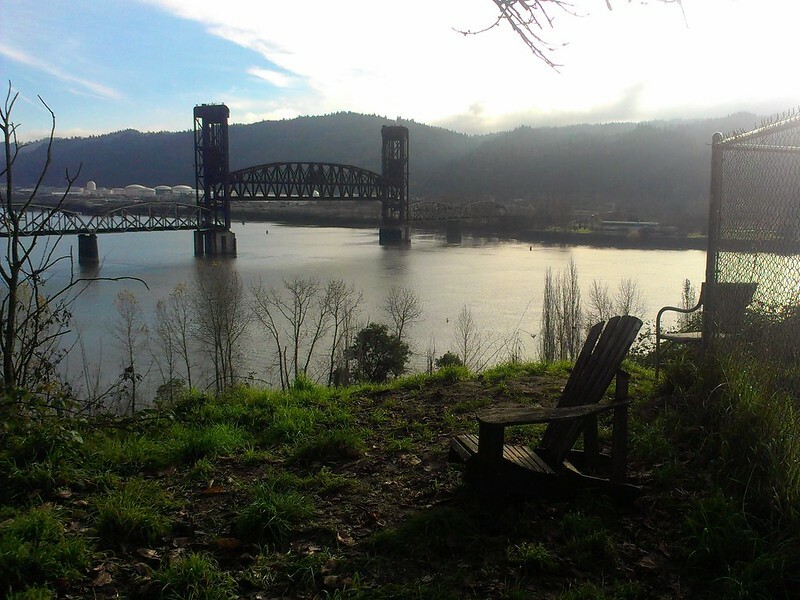 After all, North Portland has its famed bluffs over the Willamette River with their views of the valley below and the West Hills beyond. I would be ready for rough stuff with my spats. And while the Roughest of Stuff would be found over in Forest Park, there were plenty of opportunities in North Portland. While Portland can be thought of as being "a major American city", there are a lot of unimproved streets within the city limits. Most of this happens in fringe areas, whether on the outskirts of town, or near a rugged area like the West Hills. Or the North Portland bluffs. I was actively seeking out as much of these opportunities as possible. The nameless nook by Rivendell Ridge. 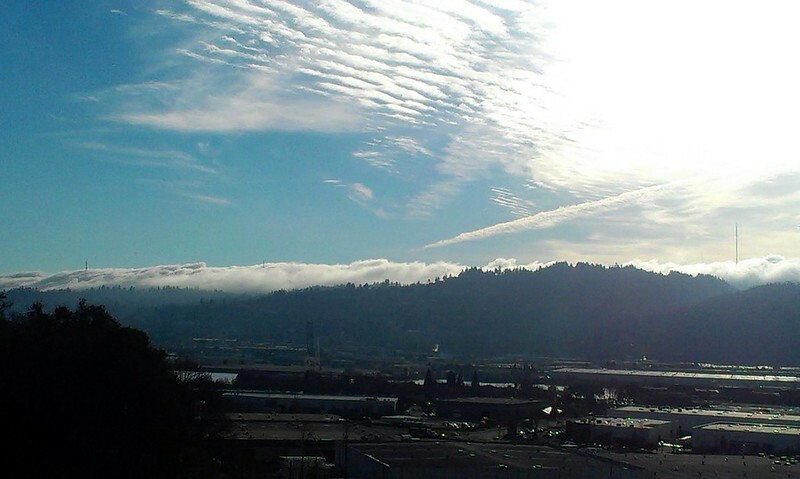 Fogbank waits over the West Hills. Burlington Northern Railroad Bridge with St Johns Bridge beyond. Of course, with all the distractions, the clock was ticking. I didn't get to St Johns until after 2:30. And I was hungry. 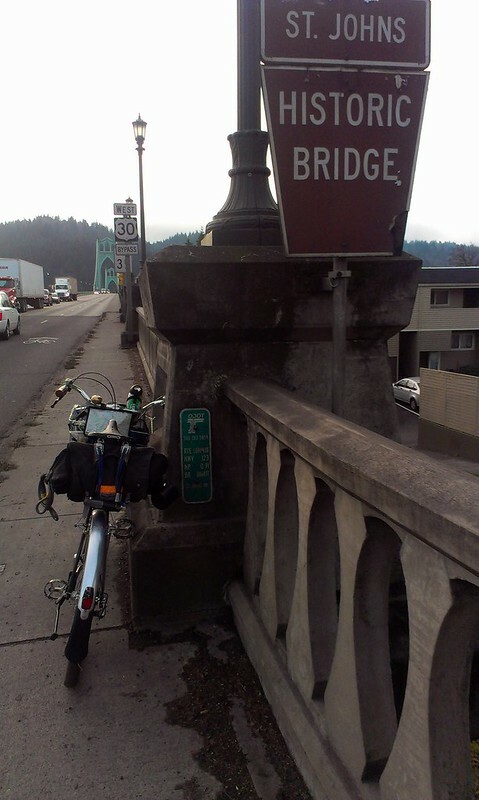 I didn't want to enter the near-wilderness of Forest park without fueling up, so I got some chili at Proper Eats, then crossed the St Johns Bridge at 3:15pm. I aimed for the most direct way up to Leif Erickson Drive from the bridge: Springville Road. And when I mean up, I mean UP. The road climbs 600 feet from the west bridgehead (about 100 feet). Grades as much as 15%-20%. This steepness made me second-guess my decision to eat right before tackling the hill. Needless to say I walked more than I rode. But Rough Stuff sometimes requires ya to "get off and walk." Where Springville Road (on the left) meets Leif Erickson Road (center). 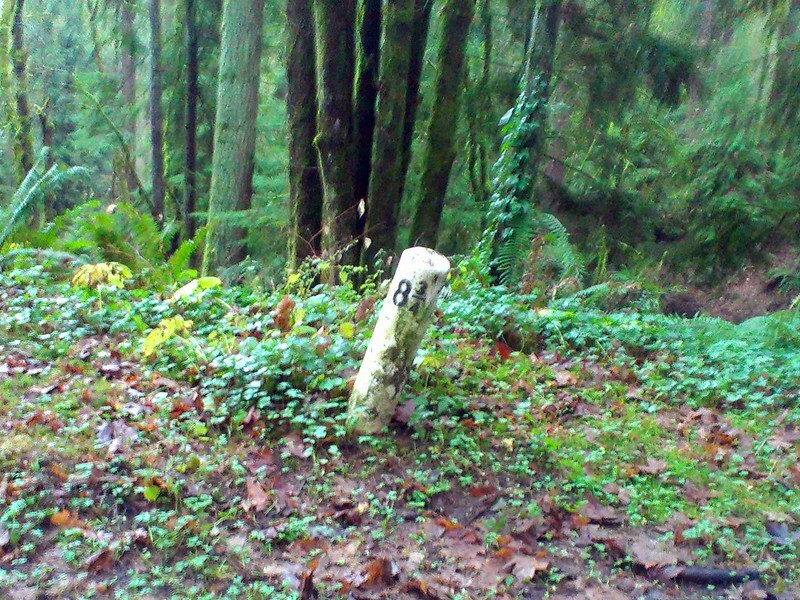 Mileage marker on Leif Erickson. A rare view from Leif Erickson. Anyways, I finally reached Leif Erickson Road. It had been years since I've been on this road. 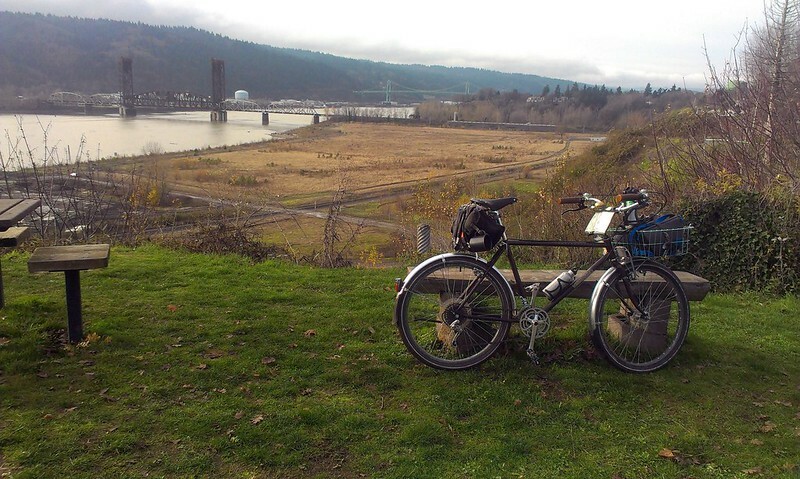 The last time was maybe seven years ago in 2005, when I still owned my "first bike" in Portland--a Giant Rincon. The Giant was your garden-variety generic mid-90's steel rigid-frame mountain bike. Like most urban folk who owned a bike like this, I had "street" tires on it, most likely 1.5" wide. I remember not liking the road, the bike not handling that well on the rough road. This time, however, was much different. I thoroughly enjoyed riding Leif Erickson. 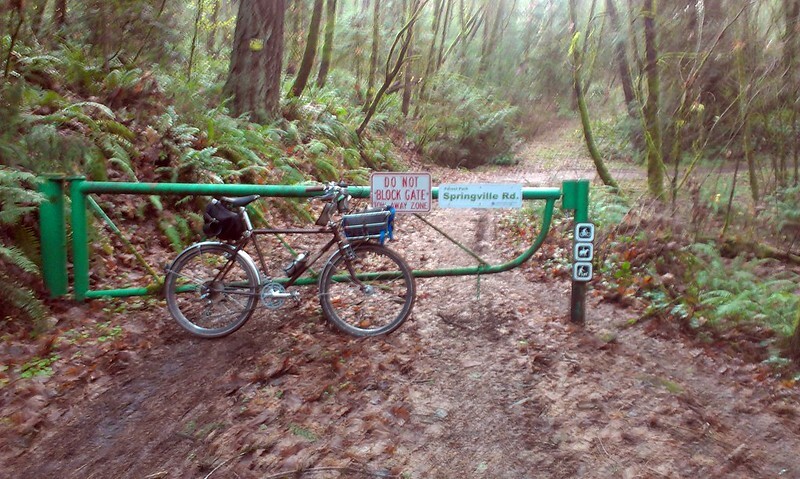 Not that the roads were better--this time I was riding in December, when parts of Leif Erickson are quite boggy. The last time I rode was during the height of summer, when everything was dry. No, a lot of the joy in the ride came from the fatness of the tires. They handled the rough and the boggy well, even though the treads were slick. But the dark was coming. When I reached Leif Erickson, it was about 3:45pm. Sunset was at 4:22, and in this wooded environment dusk wouldn't last long. And I didn't intend to mountain bike in the dark, at least not tonight. So instead of riding the 10 miles of Leif from Springville to the gate at NW Thurman St, I turned onto Saltzman Road at about mile 6. Saltzman was a quick two-mile drop from wooded Forest Park to the industrial bottoms along the Willamette. St. Helens Road was flat and lit, but at rush hour was very busy and unpleasant. I got to NW Portland in no time. Leaving Forest Park, Saltzman Road gate. So the Crested Butte's first full "rough stuff" expedition was a success. The setup worked well, and I didn't feel compromised with a loaded front basket. And after avoiding Leif Erickson and Forest Park on a bike for a long time, I know I can have fun here. I'll be back to explore the wooded lanes soon. And next time, I'll get there earlier. A map (PDF) of mountain bike opportunities in Forest Park here. it's comforting to know sometimes you walk it. btw, saw your show at bikeasaurus: very nice! Having somehow survived a recent trip to Los Angeles sans bicycle, my next Mecca is PDX. But never again will I journey forth without a bicycle. Never. Maybe New Mexico. I have friends there. Hell, I have friends everywhere. I have readers, apparently, in Africa and Russia and China. In Los Angeles you just walk onto the train with your bicycle. So I guess a Traveler's Check? Might as well be a Rolls Royce with my current funding. After that ride ya might name the CUB Frodo. What a disjointed and screwy comment. I need more beer. I'll be right back. Just remember: it rains a bit here in Portland. But we have plenty of establishments to take care of your beer and coffee (and bike) needs. Now this is a post I've gotta comment on. Throughout the spring, fall and most of the winter, I commute (also in Portland - hey neighbor!) with some French military wool knickers. They are fantastic on every level although, when the temperatures really drop, I get knee high socks and pull them up to fabricate full leg covering. It's a decent solution but the socks always end up falling. The spats you mention from Fabric Horse have my eyebrow raised. Can you speak more to their ability? Meaning, how is their insulation from cold and water? Being that we are both in Portland sure helps for an "apples to apples" location comparison! Hello Josh! Yep, old military knickers are great for riding/commuting. 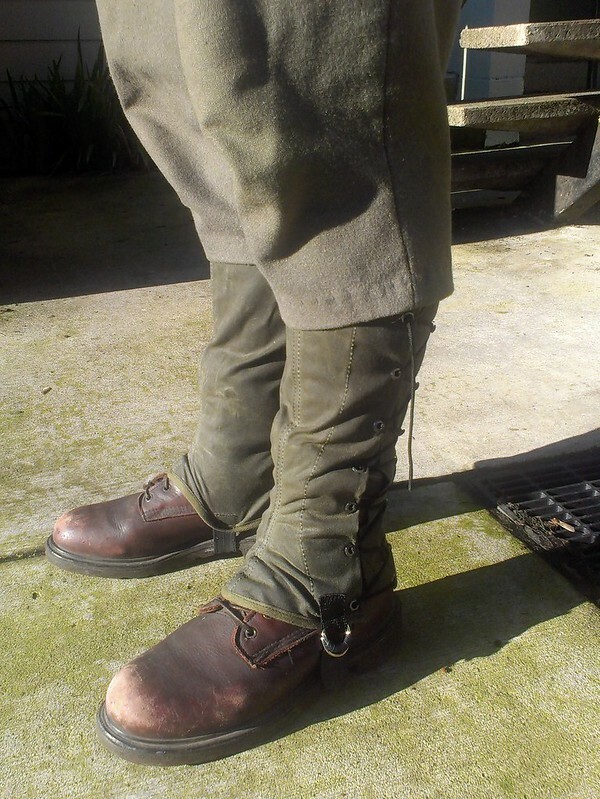 My pants are "knickerfied" old wool military trousers, as all the knickers I can find at Andy and Bax will never fit me. I've only had the spats for about two weeks, and used them twice, once on the Thursday ride mentioned above, and today when it was really raining. Today the spats kept me nice and dry. (I was wearing different footwear today, allowing the spats to "fully close" on the sides, vs. my Red Wings on Thursday which didn't, which is why there was some moisture on the inside of the spats then.) They seemed to insulate o-k, though good wool socks would be a must. Much obliged on the reply. You can bet I'll be watching out for your review. Glad you brought them out today as the rain barely stopped all day. You seem to be putting them to the Portland test. Nice work! Love the spats and congrats on the successful rough stuff outing. Your west coast references to Leif Ericksen were surprising for me as my association with the name is the viking explorer. I'm guessing the road is named after a different Leif?